They say that a poor craftsman often blames his tools. Well, in the landscape, there is a whole array of equipment that you may or may not want to buy. It all depends on the size of your property and your personal preferences. Generally, garden equipment falls into two broad categories. Hand equipment is all you need for most projects. Power equipment comes into play when you have a large landscape or very limited time available. Cables for Trees - When that old specimen oak begins to split apart but you want to try to keep it going a few more years, an arborist can sometimes pull it together with cables. 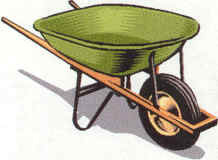 Carts - From wheelbarrows to those nice ones with bicycle tiers, garden cards help relieve your aching back. Edging - Many people like to make the edges of their beds and borders more permanent and there are an array of materials for this purpose. Or, you can just cut new lines every spring and, perhaps, once more during the growing season. Irrigation - From hand watering to automatic, in-ground systems, there are a lot of ways of providing needed moisture to our landscape plants. Pruning - Removing dead, diseases or dying parts of plants can be a routine chore in the landscape. Also, keeping plants to a size and shape you desire will require some pruning. Staking - Although not always needed, sometimes it is desirable to provide some extra support for our landscape plants. Support - Certain plants, especially vines, need support to get them up, off the ground. There are a variety of techniques for helping these plants head toward the sun. Tillers - When preparing new beds and borders, a power tiller can come in handy to save your aching back.